We finished the deployment on Thursday morning with two of the larger schools. First thing, we went to Tiniente Aquino, in time for their ceremony. While quite used to these now (various talks and testmonials, press, the national anthem and a dance performance) it was again exciting to witness the excitement in the air. At the close of ceremony we went into the classes and initiated the handout. Now experts in the art, we arrived at the final school (for now), Herminia Machada. The introductory ceremony featured a dance including an XO laptop! Everyone was very friendly and after a small hiccup with the server, everything was fine. To mark the end of the deployment, we returned to the school of Daniel Ortellado, where a lunch had been prepared for the whole team. We then spent some time with children exploring their laptops. As we sat down for a group photo, more and more children came over to take photos using their laptops, refusing to let us leave before they had captured the moment for themselves. For us, it was a nice point on which to end the week. Of course, with only a small team distributing almost 1000 laptops per day, some hiccups are inevitable. The worst error was when we accidentally missed 6 classes when deploying at one school, but with support from the teachers we finished everything off a few hours later. Some children had not been correctly registered with us, so did not receive laptops initially. Try telling a child that there is no laptop for them when all of the other children are turning theirs on for the first time. Raúl was so touched by one teary-eyed girl in this situation that he actually gave her his personal laptop, but after a few minutes of exploring she was considerate enough to hand it back and wait a day or two for us to solve the problem. Another difficulty is with faulty laptops; only a few have been reported so far, but it’s difficult when you encounter them. Our strategy for this and for missing laptops was for the teachers to make a list of problems to hand to the principal of the school. With our tight schedule, it was simply not possible to fix the problems on-the-spot, but we managed to attack them school-by-school in timely fashion. ParaguayEduca officially formed less than a year ago, so it is a great achievement for them to have now saturated 50% of a big city through deployments in 5 rural and 5 urban schools. Funds have already been secured to purchase laptops to saturate the other 50%. The support from sponsors, teachers, parents and communities here is incredible; the combination of public and private sector interest plus links to government seems to be the perfect recipe for such a project in this country. 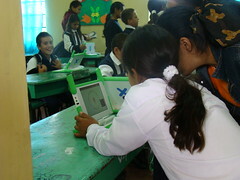 Of course, this is not the end of the OLPC Paraguay implementation, it is merely the start. After several hours of preparation in the gloomy hours of Tuesday morning, we hopped in the truck and returned to the school of Tiniente Fariña to deliver laptops to the students who attend the morning shift. Everything went smoothly, as the teachers had already learned the handout process from doing it in the previous afternoon. Following on, we delivered to the rural school of Daniel Ortellado. 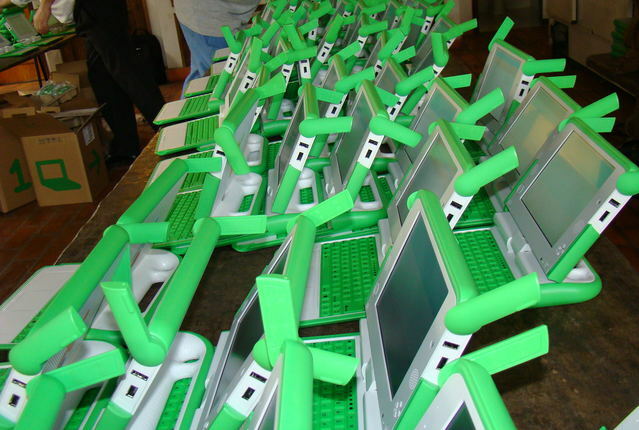 Like many schools, this one has now been themed for OLPC by the students and community. 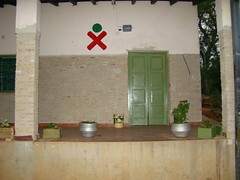 You can see one of the several XO logos freshly painted on the exterior in the photo below, and note the new colours of the classroom interior. Next up was the lovely school of Profesor Cabrera, slightly off out into the countryside. We arrived with perfect timing; the children were lined up in the courtyard, teachers and parents seated, ready to commence the ceremony. This video captures the excitement. Soon after, the children began to chant ‘X-O-X-O’ at the tops of their voices. After some brief talks including one from the governor of Caacupé, we handed over 6 laptops (one to each child from each grade) and then moved into the classrooms to hand over the rest. In the afternoon, we headed to Cristo Rey. This school was a little different, as at least for the younger grades, all the parents were present and they were the recipients of the laptops (before passing them onto their children later). The sheer number of people in the school made things a little more chaotic, but it was evident that the teachers had planned the procedure in advance and were well prepared for the handout. We used Wednesday to take care of some of the smaller schools. Bright and early was Raúl Peña. It was interesting to see children head straight for the internet in this school, whereas in other places, Speak and Record were the first instant-hit activity epidemics. This school is located near the main WiMaX base station which provides internet to all 10 schools, and hence has an impressively speedy connection. The internet connections are provided for free by Personal, a loyal sponsor of the project. 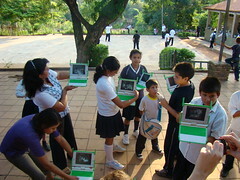 Next up, we delivered to Santa Teresita Cabañas, a rural school. This school is tiny but in some ways that made the event even more significant; the children and parents had actually turned up eagerly in the morning even though we told them that we would not be arriving until the afternoon! They held a very cute ceremony with an impressive dance performance, and then we handed out laptops to the entire school on-stage. Somehow still on schedule, we headed to Dr Pino to conclude the day, another rural school. Many parents were in attendance of the handout. This marks the end of an unforgettable week for me and the team at ParaguayEduca. Within 4 days, we completed the deployment of 3500 laptops in the city of Caacupé, Paraguay, reaching about 50% of the city’s children aged 6-12. After working close to 16 hours every day, we may have lost out on some eating and sleeping but every minute was worth it! The week really started on Saturday, when a couple of team members headed to Caacupé to start the process of labelling laptops which I will write more about the other time. They were assisted by a group of volunteers. On Sunday, the rest of us travelled to Caacupé with high spirits. We are lucky enough to have been given a beautiful, enormous old house in the city which we stayed in for most of the week. We did some planning and set up camp. Monday started at 4am, a pattern which repeated for the whole week. Most of the team went to the warehouse to continue labelling; I went to finish off some infrastructure and testing work in some schools. When 9am arrived, I had already been working in 6 schools that day. The next step was preparing for the grand symbolic event representing the introduction of the laptops, at the school of Tiniente Fariña. Everything was wonderfully prepared; we had a large audience, lots of press, and had the presence of various important people including the minister of education and the vice president. After various talks and a performance from a well known Paraguayan music group, we handed over the first 10 laptops, to 1 child from each school. At the close of the event, the children went to their classes and we started the laptop handout for the afternoon students at Tiniente Fariña. Everything went smoothly, I will be writing more about the actual logistics another time. There was much excitement in the air. 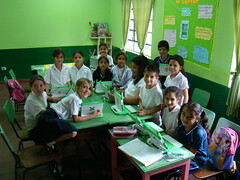 Late in the afternoon, we went to the second school, Municipal Santa Teresita. As we walked in carrying boxes, we were greeted with a huge cheer and many smiling children! Another symbolic ceremony was underway, for the parents and children of the school. We began handing out the laptops on stage and moved inside when it got dark. The children were very excited, applauding every single recipient of a laptop, but to my amazement were obedient enough to leave the school without turning on their laptops. The teachers wanted them to wait until the following day, when they would have time to assist the students getting started. One of the most amazing aspects of the week was simply the excitement of the children. 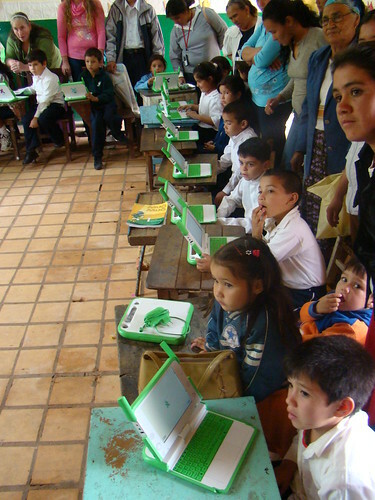 With all of the media attention of the Paraguayan project and the amazing support of teachers and the community, the children were very aware that they would be receiving laptops! 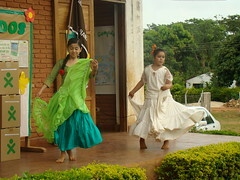 Most schools had an opening ceremony, and many have been decorated accordingly. The students had produced various artwork and posters. 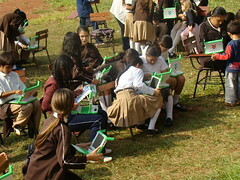 First, an interview in La Nacion: Paraguay se convierte en foco regional del proyecto OLPC (Paraguay becomes the regional focus of the OLPC project). I’m not too proud of this one, there are numerous inaccuracies and I’m given far too much credit. In print form, both of the ABC articles appeared on 1 page in the main section of the newspaper, occupying the whole page. And it was published on a Sunday, which is a day when seemingly everyone in Paraguay reads this newspaper. In addition to receiving emails from other parts of the country, various friends-of-friends have been in contact after seeing it, and seemingly everyone I visit now also knows about it! 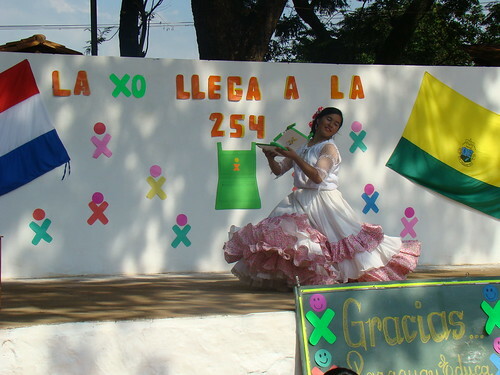 We’ve just completed installing our customized OLPC software build on 3737 XOs in Paraguay, in less than 3 days, in stupendous 37°C heat. Our secret? Tereré. And NANDblaster (for which we have coined the new Spanish verb NANDblastear). One XO acts as a server, continually multicasting the software image over the mesh. The target XOs boot the NANDblaster client from the firmware and receive the image. Communication is strictly one-way; the clients start downloading at whatever point the server was at when they were booted, and they wait until they have all the data before decoding it. There is redundancy; the XOs only have to receive any 100 in 135 packets that are transmitted for each disk block, but if they don’t then they can just pick up more on the next pass. Due to the combination of multicast and one-way communcation, there is no limit (other than physical space) to how many XOs you can NANDblast and the same time, and the speed of software installation on any XO is the same regardless of whether there are 10 or 1000 other XOs being NANDblasted simultaneously. Rather incredible! Upgrading to NANDblaster firmware and injecting security keys using a USB disk, and then starting the NANDblaster client (not as complicated as it sounds, only 4 keypresses!). Moving the XOs that are being NANDblasted to a separate area to free up power plugs for role #1, and moving the XOs that have finished being NANDblasted to the reboxing area. We had 53 power sockets available, 15 USB disks, and 6 large tables. We performed best with about 12 workers, completing more than 250 laptops per hour (2000 in 1 day). We were also assisted by our warehousing partner, Distribución Cordillera, in moving the 750 laptop boxes to and from the blasting area, and opening the impenetrable wooden crates in which the laptops were shipped (thanks, Quanta). Advantages aside, the implementation is not perfect, as NANDblaster causes some health-related side effects; I can’t close my eyes without seeing green laptops, and I keep hearing the XO startup sound in the shower.